Today is a day of huge importance. As your parish priest, and in my role of leadership here, I am absolutely 100% personally committed to what Bill Lucas and I are wanting to say today. I’d be grateful if you could have in your hands the splendid Building for Life Fund-raising Appeal leaflet. Please pray for me and Bill as you hold it. Today is a challenge for us too. 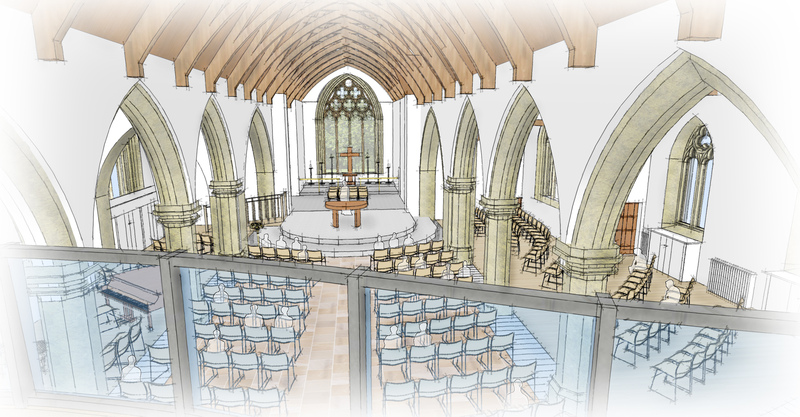 The first thing to say is that our ambitious plans for the buildings on this site are the result of a huge amount of prayer, extensive consultation and much focused hard work, especially in recent years. Some of you will remember that the paper trail goes back over 20 years. The truth is: our work as a church and parish community is being held back by our buildings. This needs to change. The plans to re-order the inside of this wonderful church of St Paul’s are about the physical fabric, but that is just the presenting need. What lies behind our plans is a growing conviction that ‘Building projects are actually people projects’. We have recent evidence to back this up. Those of you have been into St Matthew’s since it re-opened will have seen for yourselves the difference the creation of a community meeting space, kitchenette and toilet have made. Everyone has been delighted and, yes, surprised by the very significant new life these building projects have brought. Those beautiful, precious words, addressed to each of us individually, remind us that we are here in church because of our faith, which gives us both comfort and strength on our life journey. The changes that are planned within this holy space will not detract from it being a church; quite the opposite. They will enhance and beautify this wonderful building. Let me explain briefly. As you come in through welcoming, glazed outer doors, and onto a new level floor, the repositioned font will include living, moving water. The biblical text I want us to use with this comes from Psalm 87. Addressing the Lord God, the psalmist writes: ‘All my fresh springs are in you’. We know that our faith, signified by the living waters of baptism, is the source of the God-given energy that goes on springing up within us. The magnificent brass eagle, the greatest of the birds, the only one strong enough to carry the mighty words of God in Holy Scripture, will remain just where it is. The reshaped altar dais, which has worked so well this past year, is the place where we gather in an open semicircle to receive the life of our Lord Jesus Christ, under the forms of bread and wine. This will be similar and built in beautiful Purbeck stone. During the past nearly 16 years that I have been here as your parish priest, people have often said: ‘I wish there was a small, quiet, warm space, always available for prayer. If there was, I could drop in to St Paul’s at any time’. I know that many of you long for such a place in which to pray. I believe with all my heart that what we are setting out to achieve together in St Paul’s will breathe new and renewed life into all that we seek to do, and be – together, and Beyond Ourselves. Dear friends in Christ: today is the day; now is the time. Please respond to this appeal as generously as you possibly can. And now I hand over to Bill, who is chairing our Fund-raising Committee. Let me start by asking for God’s blessing on what I am going to say to you today and for your prayers now and in the coming months. For the truth is that I am feeling nervous. While I often give talks on large stages as part of my work, it’s quite different being part of a sermon, especially as I am going to tackle a tricky topic – money. Not money in the abstract, but your money! As I talk, you might like to have your copy of the Building for Life leaflet you were given when you arrived today to hand. Let the leaflet fall open at its centrespread and you can see at a glance the many new features Peter began to describe. We are going to tackle the challenge of transforming the site in two stages. In the first phase we’ll develop the inside of the church along the lines of the images in the leaflet and then, when we are ready, we plan to create a purpose-built pre-school, reconfigure the hall and landscape the whole site. To do everything we want to do in Phase 1 will cost about £850,000. Gulp! That’s a lot, you may be thinking. Where on earth will we get that kind of money from? This is all summarised on page 9 in your leaflet, under ‘An appeal for help’. You’ll see the good news as you read down the page. Praise be! We are already nearly a third of the way towards our target, as we have raised £259,000 through the Wilkins bequest, a personal pledge, a charitable donation and our recent Community Day. So now let’s think about what we can do – all of us at St Paul’s and St Matthew’s, maybe even including someone who is just visiting today and is touched by our welcoming vision. Turn to page 10 and you’ll see that there are three ways you can help. The first two involve money and the third needs time and effort. spread your giving over 24 months, if that’s more realistic. Last week Peter Seal wrote to a small number of us involved with the PCC and the two Building for Life committees. He asked us if we might consider making an early pledge towards our appeal. Fifteen people have already responded with extraordinary generosity and have pledged more than £68,000. If you are one of these people, thank you so much. You are an inspiration to us all. With £327,000 as it were ‘in the bank’, we have really made a sizable dent in what seemed like a very large mountain to climb. I said there were three things you can do. The third thing is to use your energy, time and creativity to organise an event to raise money. Of course, you can do all three if you choose to! Stay with me, please, for one last piece of mental maths as we look at how, with so many committed givers, it should be possible to raise a very considerable sum over a period of two years. Across our two churches there are 160 regular givers. We believe many will be willing and able to make an additional donation or increase their monthly giving in the short-term. Put simply, if you could find a tenner a week that works out, over 24 months and with gift aid, as more than £1,250. Twenty quid a week raises £2,500. On the A5 sheet headed ‘Regular donations to Building for Life’ you’ll see that we have tried to break down these big figures more clearly. Focus on the rows coloured yellow. If all of our current regular givers were able to give an extra £1,500 we would raise £300,000. And we’d be considerably more than two-thirds of the way towards our target of £850,000. I know that for some of us these figures will seem enormous – that even to find an extra £5 a week would be challenging. But I believe that, in churches like St Paul’s and St Matthew’s, there are many people who can give more generously so that the overall figure can be reached. Next week, with the members of the Fund-raising Committee, we’ll be starting to make applications to the larger charitable bodies. We’ll be helped in this task by a new member of the team, appointed yesterday: Nikki Prentice-Jones. I’m so grateful to you for listening to this unconventional addition to a sermon. If you got lost as I explained our approach, please forgive me. I’ll be happy to chat after the service. You may have noticed that he stopped short of the last verse: ‘For my yoke is easy and my burden is light’. In the children’s story I explored this simple but compelling paradox, that a yoke to Jesus is not a burden but a lightening of our load. A simple but compelling paradox: a yoke to Jesus is not a burden but a lightening of our load. What might at first sight seem to be a burden will, in fact, turn out to be a joy. I firmly believe that, with willing hearts and with much prayer, what might at first sight seem to be a burden will, in fact, turn out to be a joy. ‘Give’ as Luke says, ‘and it will be given to you’. Let us yoke ourselves to the living Christ and create a church that will truly be welcoming to all who are weary. Please study and pray this leaflet. Talk with your nearest and dearest and be as generous as you possibly can. Thank you.